Hanergy Europe wilt graag een promo maken ten behoeve van het Chinese nieuwe jaar. Deze video wordt geshowed op het grote jaarlijkse event van Hanergy in Beijing. Established in 1994, the company is headquartered in Beijing and has a total of 15,000 employees. It has branches in provinces all over China as well as in the Americas, Europe and the Middle East, Asia-Pacific and Africa, with core businesses covering hydropower, wind power and thin-film solar power. At present, Hanergy’s total installed capacity of hydropower projects exceeds 6GW, and its total installed capacity of wind power projects is 131MW. In the field of thin-film solar power, the company engages in the integration of the entire thin-film value chain, covering R&D, high-end equipment manufacturing, thin-film solar module production and construction of thin-film solar power plants. At present, Hanergy’s total installed capacity of hydropower projects exceeds 6GW, and its total installed capacity of wind power projects is 131MW. In the field of thin-film solar power, the company engages in the integration of the entire thin-film value chain, covering R&D, high-end equipment manufacturing, thin-film solar module production and construction of thin-film solar power plants. It has invested in the construction of thin-film solar R&D and manufacturing bases throughout China with a total production capacity of 3GW. 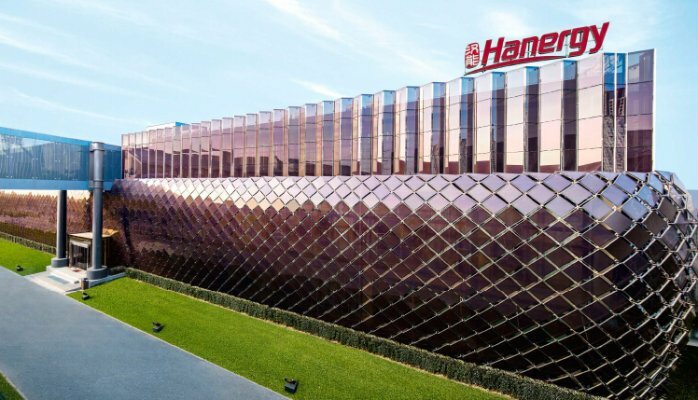 In addition, Hanergy has entered into thin-film solar power plant construction agreements across the globe totaling a capacity of about 10GW.